Just as there is an interlude between the sixth and seventh seals (Revelation 7), there is an interlude between the sixth and seventh trumpets (10:1–11:13). Interludes provide additional information tied to the first six events (often even earlier). Thus – the interlude (called by some an “interpretative parenthesis”) covers not only the era of the previous “six,” but even events which lead up to their onset. “When the seventh trumpet sounds, the mystery of God on earth will be finished” (10:7). This means that the first six trumpets take us right up to the final moments of time (actually the Second Coming)! When that ends, a 42-month clock (Revelation 11:2) and a 1260-day clock (Revelation 11:3) will begin. At its end, we know from Daniel, God’s people will be delivered (Daniel 12). The Second Coming will be imminent – the “mystery of God” will be finished. This interlude explains the divine purpose for God’s people during the period of the trumpets. It also helps to clarify why they are an answer to the saints’ petition for God’s vindication in the face of persecution and martyrdom (cf. 6:9-11 – fifth seal). Interesting is the observation that this interlude is the only one where John is asked to play a role. “Prophesy again” (10:11) – he had never been previously asked to do so. This, symbolically, represents the role of the two witnesses discussed in the next chapter. He is also asked to measure the temple, those leading out and the worshipers (11:1). John’s “measuring” symbolically represents the use of a moral standard that God’s people will be judged by – a judgment of the living. We will discover why “eating” an unsealed scroll provides an authoritative basis for John’s prophesying/witnessing. As the interlude and the seventh trumpet end, so does history (11:11-13, 18). When impenitence has reached its intractable height (9:21, 11:7-10), the end comes. The intensity of God openly confronting evil is heightened in these chapters. The existential heartbeat of the Apocalypse is accelerated. A Heavenly Guest Lands on Earth! “And I saw another mighty angel come down from heaven, clothed with a cloud: and a rainbow was upon his head, and his face was as it were the sun, and his feet as pillars of fire” (Revelation 10:1). The “I saw” heralds a new visionary scene. John is now on earth observing a “mighty angel” “coming down” or descending from heaven. A similar “mighty” or strong angel is described in 5:2 and 18:2. His attributes are similar to those of Christ, described elsewhere (1:13-15)! Beale identifies characteristics parallel with other beings described – “like a son of man” (14:14-16), the Son of Man in Daniel 7:13 and Michael, the Archangel, in Daniel 10 and 12. This picture will soon be contrasted with the beast ascending from the bottomless pit (11:7; cf. 17:8)! Christ descends to help His people finish His work! Satan ascends from hell to help his people finish his work (cf. 9:2)! Another similarity with the Being clothed in linen is in Daniel (12:7). We will visit Him later. In the Old Testament God alone is depicted as dressed with a cloud. The possible exception is in Daniel 7:13, where the Son of Man comes to the Ancient of Days on a cloud. (cf. Matthew 26:64; Mark 13:26; Luke 21:27; Acts 1:9). John later sees one like the Son of Man, sitting on a “white cloud” (Revelation 14:14-15). Then we recall Matthew 24:30: “And then shall appear the sign of the Son of man in heaven: and then shall all the tribes of the earth mourn, and they shall see the Son of man coming in the clouds of heaven with power and great glory. When believers ascend to meet Jesus in the air, they do so “in the clouds.” (I Thessalonians 4:17). In Revelation 1:7 Jesus Christ comes “with clouds,” suggesting that he is surrounded by them. What might that cloud be that He is clothed with? Collective evidence suggests that this is a vast retinue of angels accompanying Jesus. Intriguingly, we will soon see God’s two witnesses (Revelation 11:12) ascend to heaven in that cloud. From a previous vision, Jesus was located [voice only] in God’s throne room (Revelation 4), then as a Lamb before the throne (Revelation 5), and now descending from God’s throne room – the center of the universe to planet earth. This is not His Second Coming but symbolically represents “mission critical” – in anticipation of that coming. He will stand on the sea and earth, owner of all (I Corinthians 10:26), ready to direct the last scenes of history. As we shall observe, man still has a personal task yet to complete during this “come down” event to prepare to give the gospel cry. That angelic cloud that “covers” or “clothes” Him symbolically helps to conceal His glory (Lamentations 3:42-44) and also suggests a heavenly retinue of beings ready to cooperate with man on Christ’s behalf! This phrase echoes, to some degree, Ezekiel 1:26-28, where part of God’s glory is “as the appearance of the rainbow when it is in the cloud.” There it describes a heavenly being holding a book that is taken and eaten (Ezekiel 1–3) (a pattern seen here in Revelation 10, yet to be described). Some assert the position of this rainbow above Christ’s head as representing a crown or glorious headdress. An emerald rainbow, representing “mercy,” encircled God’s throne in 4:3 during His judicial proceeding. Here the rainbow symbolizes Christ’s covenant promises, strongly affirming His grace and love during this intense time. Those promises will unfold in verse 6, anticipating the fulfillment of Daniel 12:7! This is a simile. John knows no way to describe Christ’s face except as the appearance of the sun! As John had challenges describing the glory of God’s throne in Revelation 4, it is daunting once again to put into words the glory of the face of Jesus! Moses’ glowing face symbolizes what will happen to the saints’ faces when they contact Christ’s glory (Exodus 34:29-35). Jesus comes down from heaven to John to convey a timing prophecy – just like he personally came to Daniel when revealing timing prophecies (Daniel 8:13–15, 12:7-12). Key prophecies, in a framework of time, are tied with divine personal encounters with chosen seers! That recognition distinguishes those messages as extremely solemn, elevated and important notices! In both Daniel 12 and Revelation 10 – Jesus presents those prophecies through an oath in the name of the Father! They are holy messages – to be mastered by all. In glorious imagery, Jesus prepares John (representing us) for earth’s final work within those event-driven, “ticking” clocks that gives supreme urgency to these chapters! Sun-like facial glory is used as a divine symbol (Isaiah 60:1-3, 20; Psalm 84:11). It is specifically associated with a Messianic figure in Malachi 4:1-2. Different from Revelation 1:16, John does not fall down in the brilliance of this divine light. Divinity has come to work with humanity. The Latter Rain power is anticipated. This imagery is modeled after Daniel 10:6, where “a certain man” had arms and feet the color of polished brass, and Revelation 1:15, where his feet were like fine brass as if they burned in a furnace when John said that he was “like unto the Son of man” (1:13). The only “pillar of fire” noted elsewhere in the Bible relates to the “pillar of fire” that gave both protection (Exodus 14:19, 24) and guidance (Exodus 13:21-22) to the children of Israel. Therefore, most scholars see this imagery as symbolizing God’s assurance of protection and guidance to His final witnesses. Thus, Christ is coming from the center of the universe (God’s throne), accompanied by heavenly angels, assuring and preparing His witnessing 144,000 people, that the covenant promises and eschatological prophecies will shortly be fulfilled. The imagery affirms His guidance and protection, encompassing the message He is about to unfold! The pillar of fire that speaks terror and wrath to the transgressor of God’s law is a token of light and mercy and deliverance to those who have kept His commandments. “And he had in his hand a little book open: and he set his right foot upon the sea, and his left foot on the earth” (Revelation 10:2). Many with scholarly arguments logically claim that this “little book” must be the same as the scroll that Christ received from God the Father (Revelation 5:7-8). But – there is one marked issue that nullifies that conclusion. The seven-sealed scroll cannot be opened until after the Second Coming. It has seven numbered seals which are opened sequentially. Jesus arrives during the sixth seal. This open little book in Christ’s hand relates to the time immediately preceding the 42 months (1260 days) (11:2-3) before that advent occurs (11:12)! There is one Biblical scroll prophecy that was sealed and is to be opened at the “time of the end.” This is described in the book of Daniel. It is the collective messages related to the chazown (ha hazon) vision (Daniel 8, 11 and 12 – selected verses). Include the ram, he-goat and little horn prophecy of Daniel 8. Include the sweeping history – the conflict between right and wrong – in Daniel 11. And are implied in the timing prophecies of Daniel 12. Those visions shall be for many days (Gabriel said – for the future – Daniel 8:26). “But thou, O Daniel, shut up the words, and seal the book, even to the time of the end: many shall run to and fro, and knowledge shall be increased” (Daniel 12:4 – Gabriel – finishing his portion of the ha hazone). When is that “time of the end?” Gabriel already informed Daniel that it would be at the “appointed time” (Daniel 8:17, 19). Habakkuk had recently shared that the “appointed time” would come after the tarrying time (Habakkuk 2:2-3). Shortly we will see here in Revelation 10 Jesus prophesying that a time delay (“tarrying time”) will soon end. The evidence is unimpeachable that these prophecies are detailed together. This “little book” is now the unsealed chazown prophecy of Daniel. Its being open in Christ’s hand announces that it can now be understood! In eating it, John announces that it must be understood to witness. John is symbolic of God’s final remnant witnesses. That prophecy was part of the mareh vision, which was never sealed. Even Daniel finally understood that (Daniel 10:1). What is the theme of the Danelic chazown visions (scroll)? And, amazingly, they include timed prophetic periods within which all will be accomplished! Since the unsealed document/little book relates to the “time of the end,” it represents distinct eschatological messages for those who will globally represent the gospel of Jesus Christ just before the eschaton! It is important to note that this little scroll is called biblaridion (10:2, 9-10). The seven-sealed scroll was called biblion (5:1-5, 8-9). Also, if they were the same, it would be expected that the biblaridion would be preceded by an article. It is not! “The scroll of destiny (Revelation 5–6) begins with the seals and continues to the end of the Apocalypse. Thus – the setting invites our deeper understanding of the great prophecies in Daniel related to the chazown visions. 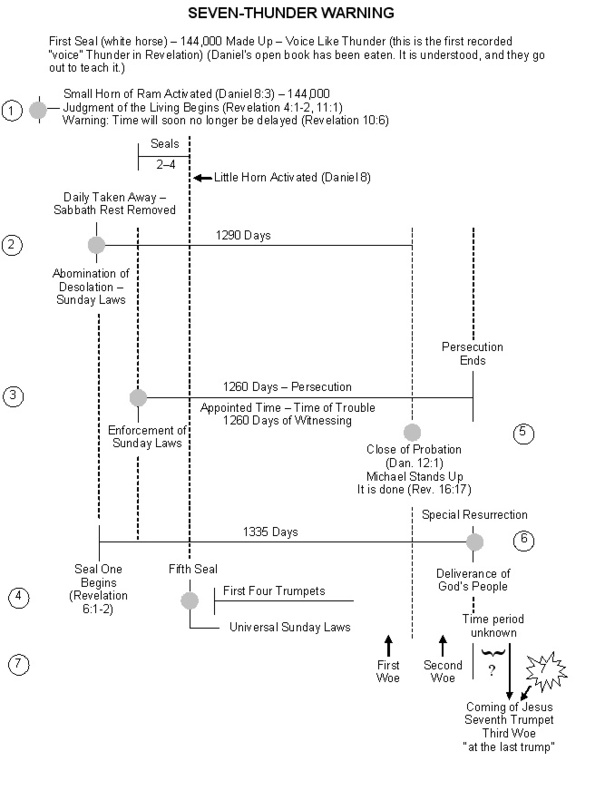 It also reveals that Daniel’s “time of the end” should relate to John’s eschatological end. This unique picture counters what later will be seen as Satan – the dragon – standing on the sand of the sea (12:18 or 13:1) and the “beast” arising from the sea (13:1). All throughout the apocalypse Satan is portrayed with a parallel counter-act to God’s plans. But God is always in control. Satan and his minions are permitted to act, to show, their characters – always within a divine limit. Jesus appears to take this sea/earth stance as He arrives on planet earth. It symbolizes his authority and dominion over the whole earth. With the scroll in his hand, its contents are meant for the whole world! Since those legs and feet are fiery pillars, that scroll will have a deliverance message for the saints and one of judgment for the unbelievers. It also creates a stunning contrast to the evil of the fifth trumpet when Satan and his angels seek control through harm and evil. In Biblical writings it is God the Creator who dominates and controls everything, to whom indeed all life is subject” (Psalm 146:5-10, I Corinthians 15:25-28, Ephesians 1:20-22). Here He places the world under the obligation of the Danelic message of the little scroll/book! On behalf of the saints “The Lamb shall overcome them” (Revelation 17:14b). Their victory is assured (Revelation 12:11). “And cried with a loud voice, as when a lion roareth: and when he had cried, seven thunders uttered their voices.” (Revelation 10:3). The lion imagery immediately calls to mind the announcement of one of the 24 elders: “Weep not; behold, the Lion of the tribe of Juda, the Root of David, hath prevailed” (Revelation 5:5). God’s voice is associated with that of a lion (Isaiah 31:4, Amos 3:7-8, Hosea 11:10). Here, Christ is speaking so the world can hear! He is compelling everyone’s attention to judicial acts associated with the thunders. “Voices” represent “decrees” or “declarations” (divine or demonic) when associated with thunder. What are we to understand? Since there is a definite article with the thunders (Greek), they refer to something John and his readers already have access to and know about. The contextual imagery suggests that they relate to the open book. Since the seer will soon eat (understand) this book, there must be seven judicial events within it! “And when the seven thunders had uttered their voices, I was about to write: and I heard a voice from heaven saying unto me, Seal up those things which the seven thunders uttered, and write them not” (Revelation 10:4). That would occur during the final generation that Jesus alluded to in Matthew 24, Mark 13 and Luke 21. There were also amazing event-driven clues, revealing when that period would be entered. Again, the article “the” before the word “thunders” (ha hepta brontai) means that they were distinct and should have been familiar to John and/or his readers! What might that message be? It relates to that little open book! – the ha hazon prophecy of Daniel. The oath taken in verse 6 is just like the one in Daniel 12: shows one as a prophecy of the “time of the end” – the other as a prophecy that that end is now about to be fulfilled! This all means that there must be seven distinct warnings or notices that encompass that Danelic prophecy! The only place in the Bible where God speaks thunderously seven times is in Psalm 29:3-9. There, the Psalmist reveals the judicial power of God over creation. He has authority to post notices and warnings. In Revelation there are other times that thunder roars. The little open book of Daniel is in Christ’s hand. It contains prophetic narratives related to God, judgment and deliverance of His people. Collectively, they anticipate the end of Satan’s rule! John hears the messages of those thunders. The contextual association with the open book cannot be ignored. Why, then, if these events are delineated in Daniel 8–12, does John get this command? There can be only one reason. John, representing the saints who will finish the work, must “eat that book” (10:9-10). It is to be digested, understood and become part of the three angels’ messages from Revelation 14! “The attention of our churches must be aroused. We are standing upon the borders of the greatest event in the world’s history, and Satan must not have power over the people of God, causing them to sleep on. The Papacy will appear in its power. All must now arouse and search the Scriptures, for God will make known to His faithful ones what shall be in the last time. The word of the Lord is to come to His people in power. Beale, G. K.; The New International Greek Testament Commentary; The Book of Revelation (William B. Eerdmans Publishing Company, Grand Rapids, Michigan – 1999), p. 520. Mounce, Robert H.; The Book of Revelation (Wm. B. Eerdmans Publishing Co., Grand Rapids, Michigan, 1977), p. 199. Beale, op. cit., p. 522. Mounce, op. cit., p. 201. Brighton, Louis A; Revelation, Concordance Commentary (Concordance Publishing House, St. Louis), 1999, p. 257. Thomas, Robert L.; Revelation 8–22 – An Exegetical Commentary (Moody Press, Chicago–1995) (quoting Swete, Scott, Ladd), p. 61. White, Ellen G.; The Great Controversy, p. 640. Brighton, op. cit., pp. 260-261. Mounce, op. cit., p. 202. White, Ellen G.; Acts of the Apostles, p. 589. White, Ellen G.; Selected Messages, book 2, p. 105. White, Ellen G.; Testimonies to Ministers, p. 115. Mounce, op. cit., p. 203. Osborne, Grant R.; Revelation (Baker Book House; Grand Rapids, MI), p. 396. Brighton, op. cit., p. 264. Beale, op. cit., p. 533. Mounce, op. cit., p. 65. Beale, op. cit., p. 535. Stefanovic, Ranko; Revelation of Jesus Christ, p. 320. Osborne, op. cit., p. 396.